They have analysed extraterrestrial dust thought to be from supernovae, that has settled on ocean floors to determine the amount of heavy elements created by the massive explosions. "Small amounts of debris from these distant explosions fall on the earth as it travels through the galaxy," said lead researcher Dr Anton Wallner, from the Research School of Physics and Engineering. "We've analysed galactic dust from the last 25 million years that has settled on the ocean and found there is much less of the heavy elements such as plutonium and uranium than we expected." The findings are at odds with current theories of supernovae, in which some of the materials essential for human life, such as iron, potassium and iodine are created and distributed throughout space. Supernovae also create lead, silver and gold, and heavier radioactive elements such as uranium and plutonium. Dr Wallner's team studied plutonium-244 which serves as a radioactive clock by the nature of its radioactive decay, with a half-life of 81 million years. 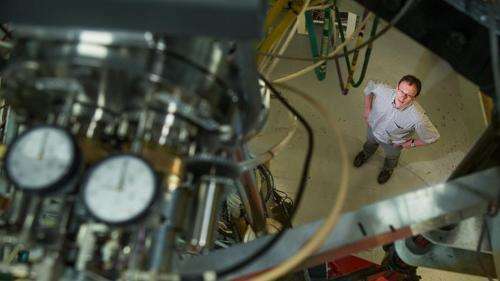 "Any plutonium-244 that existed when the earth formed from intergalactic gas and dust over four billion years ago has long since decayed," Dr Wallner said. "So any plutonium-244 that we find on earth must have been created in explosive events that have occurred more recently, in the last few hundred million years." The team analysed a 10 centimetre-thick sample of the earth's crust, representing 25 million years of accretion, as well as deep-sea sediments collected from a very stable area at the bottom of the Pacific Ocean. "We found 100 times less plutonium-244 than we expected," Dr Wallner said. "It seems that these heaviest elements may not be formed in standard supernovae after all. It may require rarer and more explosive events such as the merging of two neutron stars to make them." The fact that these heavy elements like plutonium were present, and uranium and thorium are still present on earth suggests that such an explosive event must have happened close to the earth around the time it formed, said Dr Wallner. "Radioactive elements in our planet such as uranium and thorium provide much of the heat that drives continental movement, perhaps other planets don't have the same heat engine inside them," he said. Our sun, Sol, imploded from a red giant the size of Betelgeuse, the metals excluded from the hydrogen core settling into planets in close orbit inside Jupiter. Earth in particular was left with a water veil, the elements in this water raining out --in a manner similar to the kinds of stone being solidified from magma--- when the magnetism controlling the absence of gravity lessened. LIFE particularly benefited as protected from cosmic rays. And made fantastic use of the calcium. Quote from article: "The fact that these heavy elements like plutonium were present, and uranium and thorium are still present on earth suggests that such an explosive event must have happened close to the earth around the time it formed, said Dr Wallner." Hmm, could it be that the source was Old Sol himself? Our solar system was very likely form shortly after our sun exploded into a supernova itself. Perhaps what collided with arcane Earth to form the moon was not a planet. The heavy elements are likely produced in place. The key to this line of investigation are the various fossilized and petrified forests. Careful scrutiny of these fields with an eye towards electricity will eventually prove to be a fruitful line of investigation. Not all commentators here are supporters of pseudoscience nonsense like the first five posters. When I started reading the article I immediately thought about neutron stars. Those are probably the source of radioactive heavy elements. It makes sense: what a supernova can't create, a broken neutron star may be able to make. Neutron stars would make good sources of heavy neutron radiation and thus be able to transmute normal elements into very heavy ones. I want to see two Neutron stars strike each other nearly head on at a good fraction of C. The result would be a physicists dream. I was wondering... Our Sun being the remnants of a supernova? Seriously? Perhaps you mental midgets missed the part of class that dealt with star life cycles... Only 2 things result from supernovae, black holes and neutron stars, neither of which are located in our solar system. RKBA and Velvet, what do you think happens to black holes? According to Hawkins they can evaporate over time. What do you think happens to neutrons? I will inform you, they decay with a half life of about 15 minutes. What evidences do either one of you have that the neutrons in a neutron star cannot and do NOT decay? "However, Hawking's glow is completely irrelevant for any of the black holes known to exist in the Universe. For them, the temperature of the glow is almost zero and the energy loss is negligible. The time needed for the black holes to lose much of their mass is unimaginably long." "Since a neutron star is electrical neutral, there is the same amount of β+ as β− decay, this is called the chemical equilibrium. This means, every time when a neutron decays, a proton captures (in average) an electron and the star stays stable." Although fun red herrings, neither has a place in this discussion as we are talking about our Sun. And no, our Sun is NOT the by-product of either phenomena. Quote RKBA: "This means, every time when a neutron decays, a proton captures (in average) an electron and the star stays stable." Exactly, now what do you end up with? Hydrogen, with enough hydrogen under extreme pressure what happens? Fusion, a reignited star eventually with a high percentage of hydrogen just like our Old Sol. Come on, only a 4 inch deep piece of sediment! Please, go down a couple feet. Seems way to easy. That's great, pretend electrical universe meets pretend iron sun universe. @katesisco, I'm surprised at you, you are often a voice of reason. How did you ever get the idea that the solar system is the result of an imploded red giant star? Or that anything like that could even happen? You do understand that a red giant star like Betelgeuse is a sun-like star that has exhausted it's fuel supply right? It doesn't have enough mass to implode. Or explode. Or do anything beyond casting off it's outer layers and becoming a white dwarf. @billpress11 - you end up with - get ready for it! -- more neutron matter! Not hydrogen. @jeffhas - that would be very cool indeed - from a long way away!! What do you think happens to neutrons? I will inform you, they decay with a half life of about 15 minutes. Not hydrogen. Gravitationally induced density (a fusion mechanism of sorts) creates heavier elements. WG, I have never read anywhere about heavier elements being created by "gravitationally induced density". In a supernova the "heavier" elements and neutron are created by the explosive pressure itself not by gravitational pressure. As for gravitational pressure keeping neutrons from decaying. That is not very likely after all neutrons do decay inside nuclei all the time where there is extreme pressure in some cases. And neutrons decaying into neutrons, what kind of circular talk is that? Correction, I should have stated elements heavier than iron by gravitation pressure. Read this: http://news.disco...lode.htm . You are mixing together two processes, core collapse supernova and rapid neutron capture nucleosynthesis. While both can occur during a core collapse, R-process nucleosynthesis can also occur as a result of other types of supernova. The formation of a neutron star, on the other hand, is thought to only occur in core collapse supernova. The neutron star's formation results from gravity overcoming electron degeneracy. The gravity is so strong that the normal force which stops electrons from merging with protons is overcome. The mass of the material left over is mind numbing; a teaspoon full would weigh as much as Mount Everest. Read up on them, it's really interesting. The explosion just releases those heavier elements to the immediate environment. I didn't make this case. You are. Again, two different processes. Neutron stars are made up of a very large amount of mass (1.44 solar masses(SM) up to about 3 SM) squeezed down into a tiny area - about the size of a rocky planet. It is the mass of the object that keeps it in state. If a neutron in a neutron star were to degenerate, the great gravity of the neutron star would just pull it back again. This is a very different beast from a neutron in an atom. They are bound to a proton, whereas in a neutron star there are no protons left. WG, I have never read anywhere about heavier elements being created by "gravitationally induced density". Well, looks you read it here.You think "fusion" only applies to hydrogen? In a supernova the "heavier" elements and neutron are created by the explosive pressure itself not by gravitational pressure. ? They are "created" by the "gravitational pressure"
The explosion only disperses it. and I forgot to mention - gravitationally induced - spin..
Actually WG, this isn't quite right. Elements are create by two processes, s-process in stars and r-process in supernovae. S-process elements are indeed dispersed in supernovas, but they are also dispersed during the red giant stage of stellar evolution, by stellar winds, and some other processes. R-process elements, on the other hand, are both created by, and dispersed in, supernova explosions. In neither case are they formed by "gravitational pressure". The process requires the energy generated by the supernova to work. Gravity, except for being the catalyst of the supernova, does not play a role. Actually, this is wrong. Betelgeuse is a massive star that will likely explode as a core-collapse supernova. It is red because it is nearing the end of its very short life. It is a good candidate to leave behind a neutron star, or even a black hole if the higher end of its mass calculation is correct. Oliver Manual, is that you, you old maniac! Maggnus, I will agree with you that gravitational pressure in a supernova plays a role in the creation of neutrons. But it alone in not enough to create elements heavier than iron. Neutron stars are more complicated and understood less than you make them out to be. Below is a link with a quote from the article. As you can see there are more than just neutrons on the surface of a neutron star. Some sites even refer to an atmosphere on their surface. Here is another thing that is just ignored. There is a background of neutrinos in our universe. My question is what would happen to these neutrinos that strike a neutron star? I think most are absorbed which would over time add heat to the neutron star. This would add heat to the surface and in the interior. This would change the neutron star over time in ways we have not even began to understand. I think it would very likely cause the neutrons to decay over time. Thereby creating hydrogen. Eventually a sun like Old Sol. On a time crunch so I'll copy and paste someone else's answer. "The main problem is that there is a lot of kinetic energy left over after the decay and the electron and proton don't stay around long enough to bind into a stable hydrogen atom. Matters are further complicated by the fact that there is also an electron anti-neutrino involved in the reaction. n -> p + e- + vbar. Since the binding energy of an electron in a hydrogen atom is only 13 eV (electron Volts) and the kinetic energy released in the decay is over 700 million eV the electron and proton tend to just fly apart. The anti-neutrino, being electrical neutral and weakly interacting, isn't involved in the final state. It just carries off some of the kinetic energy. From time to time the neutrino will carry off enough energy to leave the electron and proton relatively at rest. In that case they can form a hydrogen. It has been observed but seems to occur on average 4 times out of one million neutron"
RKBA, once a neutron decays the proton and electron do need to form a hydrogen atom. It is the protons that would fuse releasing huge amounts of energy. Bill, that's fine and dandy, but they DON'T. Only 4 out a million actually decay into Hydrogen. You are not accounting for the anti-neutrino that brings excessive energy to the equation. RKBA, I don't get your idea that there is excessive energy. In a neutron star there is a lack of energy, it was carried away when the core collapsed into a neutron star mostly by anti-neutrinos. It is similar to how pressure releases energy even while increasing the temperature. A neutron star is starved of energy at a low energy level even while having a very high temperature. Here is another way of looking at it. Are there hydrogen atoms in the interior of the sun where fusion is taking place? No, it is a plasma of free protons and electrons. I deleted the double posting here. I understand that you don't understand. I'll re-post what I've already said, hoping you'll read it this time around. "The main problem is that there is a lot of kinetic energy left over after the decay and the electron and proton don't stay around long enough to bind into a stable hydrogen atom. Matters are further complicated by the fact that there is also an electron anti-neutrino involved in the reaction. n -> p + e- + vbar. Since the binding energy of an electron in a hydrogen atom is only 13 eV (electron Volts) and the kinetic energy released in the decay is over 700 million eV the electron and proton tend to just fly apart." I'm sorry I thought I made it clear that gravitational pressure has nothing to do with it. It has to do with very fast moving neutrons striking heavy atoms, which creates heavier atoms. That's why it's called rapid. Neutron stars are more complicated and understood less than you make them out to be. Well, yes but I'm not talking to a PhD in physics. They are somewhat understood, but there are a lot of things to learn about them. That's why I said they are interesting, and also why I suggested you read up on them. Nice wiki cite BTW :). "Here is another way of looking at it. Are there hydrogen atoms in the interior of the sun where fusion is taking place? No, it is a plasma of free protons and electrons." Most definitely there IS Hydrogen in the core of the sun. It's what's fueling the fusion reaction and the needed ingredient to make Helium. "Approximately 3.6×1038 protons (hydrogen nuclei) are converted into helium nuclei every second releasing energy at a rate of 3.86×1026 joules per second." Neutrinos rarely interact with other matter, and neutron stars are already very very hot. Remember, they result from an exploding star. Regardless, extra heat will have no effect on a neutron star, only the addition of mass would do anything - and with enough mass, it could pass the limit of electron degeneracy and collapse to become a black hole. To collect enough neutrinos to pass this mass limit would take a very long time - longer than the lifetime of the universe. RKBA, he said hydrogen ATOMS, aka neutral hydrogen. Everything in the sun exists in an ionized state. RKBA, you are correct, I don't understand what you are talking about when you refer to "excessive energy". What would that have to do with preventing fusion? Fusion takes place in a plasma anyway. Maggnus, true neutrinos rarely interact with matter, they also rarely interact with neutron stars. Ordinary matter is almost entirely empty space. It is not difficult to figure that most neutrinos would NOT be able to travel though a neutron star without being absorbed. After all where are a multitude of those neutrinos created in the first place? To ignore this is a major flaw in the present theory about understanding the lifetime of a neutron star. Longer than the lifetime of the universe, that is certainly debatable, more likely only a few tens of million years to make minor but noticeable changes in a neutron star. Sorry RKBA, they are not hydrogen atoms, they are a plasma of ionized hydrogen atoms. Sorry but another double posting came up so I deleted it. Bill, Your argument was that neutrons decay inside a neutron star, resulting in Hydrogen atoms, which you then postulated could give birth to our Sun. Deflecting the argument will not work. Anon... ionized hydrogen is still hydrogen. Does neon gas in a sign stop becoming neon when the sign is on? And again, this has NO bearing on the original discussion of a neutron star trans-morphing into our sun! It may still be hydrogen but it is NOT an atom of hydrogen. You are arguing with yourself here. Atoms of hydrogen do not fuse they are at a much to low energy level for that. Only ionized hydrogen, which is not a hydrogen atom can be fused. Duh. He said there aren't hydrogen ATOMS. That typically implies a neutral charge, so he was correct. There isn't any neutral hydrogen in the sun. And again, this has NO bearing on the original discussion of a neutron star trans-morphing into our sun! I can see hydrogen plasma inside a typical sun such as ours. However, I feel the density of a neutron star possibly being too great for that and instead having just a bunch of stripped protons, spinning at the core, surrounded by a shell of electrons. Ionized hydrogen IS most assuredly still an atom of Hydrogen. Read up on the solar flares from 2006..
"We've detected a stream of perfectly intact hydrogen atoms shooting out of an X-class solar flare," says Richard Mewaldt of Caltech,. "What a surprise! These atoms could be telling us something new about what happens inside flares." "No other elements were present, not even helium (the sun's second most abundant atomic species). Pure hydrogen streamed past the spacecraft for a full 90 minutes." That's not right anon. Ionized hydrogen is still an atom. It has just been stripped of its electrons. It is still made up of one proton and one neutron. the smallest component of an element having the chemical properties of the element, consisting of a nucleus containing combinations of neutrons and protons and one or more electrons bound to the nucleus by electrical attraction; the number of protons determines the identity of the element." Technically ionized elements are NOT atoms because they do NOT have ANY chemical properties, period. I stand corrected. Ionization extent of elements in stars is a function of temperature. Ionization temperature of hydrogen is within the range of 5000K to 10000K, so with a surface temperature of a little over 5700, hydrogen on the surface of the sun is slightly ionized. However, anything under the surface is completely ionized. The term "atom" is reserved for neutral configurations. RKBA, I never said there were not any hydrogen atoms on the surface of the sun. What I said was where the fusion of hydrogen protons is taking place there are not hydrogen atoms only a plasma of ionized hydrogen atoms. Notice the adjective, IONIZED. As for your original statement about the "excessive energy", well I'm still at a lost of what you are talking about. After all excessive energy is NEEDED to fuse hydrogen protons in the proton-proton chain reaction. billpress and anon - I stand corrected, an ion is not an atom. After all excessive energy is NEEDED to fuse hydrogen protons in the proton-proton chain reaction. Well, yes, but where does this energy come from? The initial p=>p reaction in the core is a function of temperature and pressure. LMAO Ok Bill, you keep telling your bad self that. Don't tell that to Deuterium. I am not claiming that this is correct, it is just an idea. I think the energy is accumulated over 10's of thousands of years from the neutrinos absorbed by a neutron star. Also the fusion of protons from the decaying neutrons would most likely be able to take place on or near the surface of the neutron star due to the intensity of its strong gravitational field. This has been exasperating, I'm done. Good day Bill, may your hunger for knowledge continue. However, Mag, Hydrogen atoms do not contain a neutron (unless they are deuterium). So hydrogen atoms, stripped of their electrons, are simply free protons. "instead having just a bunch of stripped protons, spinning at the core, surrounded by a shell of electrons." - is plausible. Heavy element production in case of galactic black holes- in the vicinity 'frame dragging' occurs- what happens in that case- some matter being dragged in would fuse, but in a drastically changed spacetime, wouldn't the energy equations change? could it be that elements of higher atomic wt than iron are produced, some of them spewed around and out by the black hole jets? would this be another source of higher elements, other than supernovae? (c) follow this by calculating at what distance from a galactic center supermassive black hole, does frame dragging occur, and what would be the zone of the changed spacetime conditions, with respect to fusion as a nuclear process. (e) concluding by calculating the proportion of that matter that may result in the production of heavier elements. There is not enough room to point out all of the misunderstandings. I always thought plutonium being transuranic doesn't occur naturally, is this not the case?